I love sticky rice. I love making it and I love eating it and I just plain love the look of it. Although this drawing hasn’t ‘made it’ onto a towel or tote bag with EAW designs, it’s still a favorite. Certainly the color makes me happy. Happiness is tied to circumstance and joy is tied to spirit and gratitude. 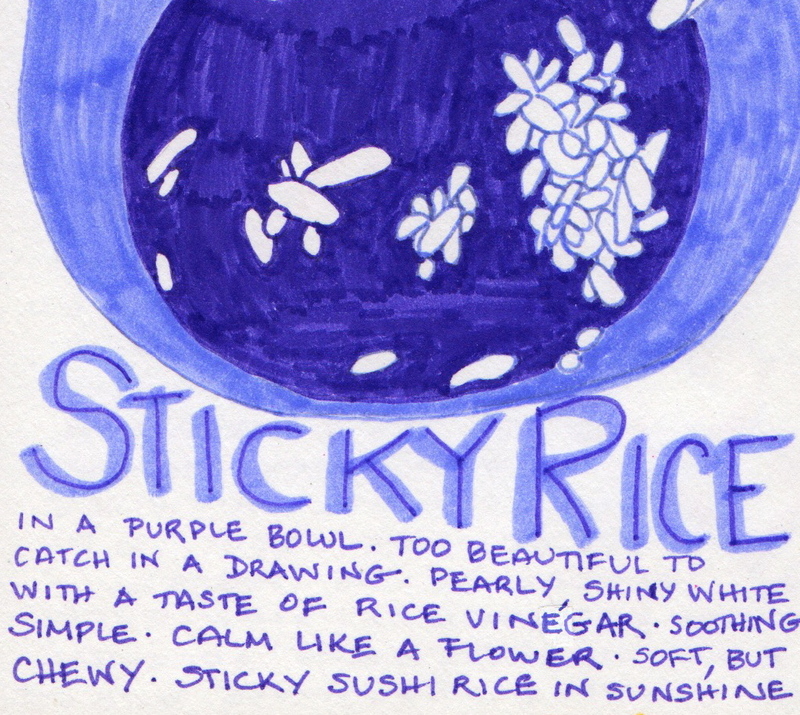 When I make sticky rice for my family, I have created circumstances that make me happy. I enjoy the soaking and the rinsing and sight of the rice cooker steaming away. I love the dousing with rice vinegar and the mixing with the wide, flat bamboo spoon that I brought home from Kyoto. So I have made myself happy. The beauty and simplicity of the cooked rice and the memory of the little side-street bamboo shop in Kyoto awaken my gratitude. Those pearlescent grains remind me of the joy of cooking whole foods and connect me to all that I have en-joyed in this life. That’s an especially wonderful thing when I’ve been raking muck, about PPFIC and personal shame history, as I have been so often lately. So what about Oreos? Am I happy when eating Oreos? Not an Oreo; Oreos. Me and the rats. What circumstances take me to the Oreos? None of the sensory pleasure that I’ve been extolling about the rice, that’s for sure. In fact an Oreo eaten whole can be a bit dry. I’m not a ‘dunker’; although tea or water does help. But it’s that creamy white center: sugar and fat whipped up together to seduce my bliss point. Pleasure centers in my brain start ringing and singing and, as I understand it, producing a spurt of happiness chemicals. But memories? Nothing but shame. No gratitude or joy to be found. Sneaking cookies, hiding cookies, eating cookies when I wasn’t hungry. All for that unbelievably brief illusion of happiness. How did I respond to that flush of shame? How did my body respond to the shot of sugarfatbliss? I would reach for another Oreo. But to repeat the question: What circumstances take me to the Oreos? I believe another important piece of the puzzle is habit. Okay, maybe that seems ridiculously obvious, but the thing is that while the pleasure centers are being zinged by the creamy filling, neurological patterns are being reinforced in my brain. Every time I would reach for that Oreo, the habit became a bit stronger. Again, that may seem too obvious, but understanding the process has been eye-opening for me. It’s all part of the same show. I read Charles Duhigg‘s book, The Power of Habit almost as soon as it was published in 2012. I am rereading now, along with the other sources I’ve been writing about, because it so clearly dovetails with my explorations. I want to make sense of the connections between the PPFIC’s push toward producing addictive food products and personal habit and shame. It’s all there, it’s all of a piece, I am sure of it. A final note about getting the car into position for jump-starting. It has taken years of sweating and pushing to turn the vehicle of my life around, so that a jump start was even possible. So that this writing exploration could begin. And as you know, you can’t push a car by yourself, even a 1960’s VW beetle. Standing shoulder-to-shoulder with me, believing in me when I have not, reminding me I am not alone no matter how hard it gets and helping me onward by sharing her own courage, I am ever grateful to my dear friend and writing ally, jc. Tea and toast for two. This entry was posted in Food, Writing and tagged Brené Brown, Charles Duhigg, circumstances, habit, jump-start, NaBloPoMo, Oreo, Oreos, Packaged & Processed Food Industrial Complex PPFIC, Pushers, salt sugar fat, shame, sticky rice, writing by Assembling a Cooking Life. Bookmark the permalink.